We wanted to make these available in a digital format so that you can store them in a smaller file size, use them on your computer, iPod, or other MP3 or Digital Music Player. Also you can burn a CD from these files as well. It's the cheapest and fastest way to get you these sermons into your hands right away. We highly recommend iTunes by Apple due the to ease of getting the files downloaded and use them either on your iPod or burn a CD with the iTunes Software. You can download these sermons in audio format FREE of charge. It will be stored on the computer you download it to and you will have rights to use on your ditial player such as an iPod or MP3 player and also to burn a CD of it to listen to on a CD player. There are nights to distribute this in any format, in any way. A podcast is a series of digital media files, usually digital audio or video, that is made available for download via web syndication. 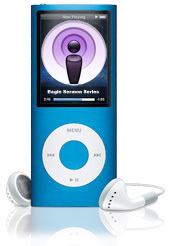 The syndication aspect of the delivery is what differentiates podcasts from other files that are accessed by simple download or by streaming: it means that special client software applications known as podcatchers (such as Apple Inc.'s iTunes or Nullsoft's Winamp) can automatically identify and retrieve new files when they are made available, by accessing a centrally-maintained web feed that lists all files associated with a particular podcast. The files thus automatically downloaded are then stored locally on the user's computer or other device, for offline use.